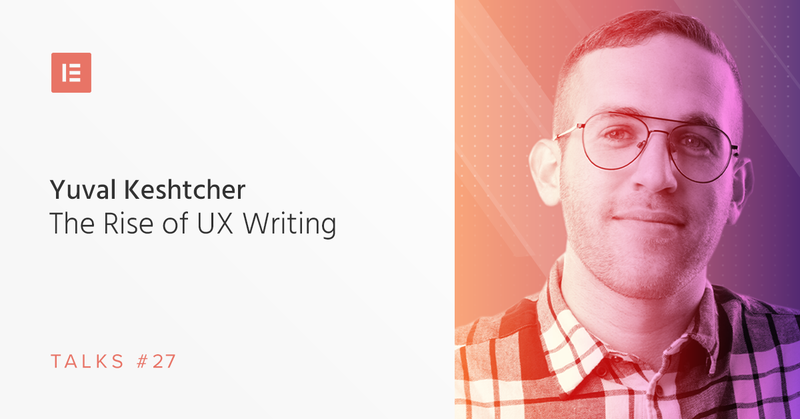 Yuval Keshtcher is a UX and graphic designer who has kept himself busy over the last few years with developing UX Writing Hub. On our podcast, Yuval explains what UX writing is, talks about the course he launched and delves into why designers still hesitate to use WordPress. Yuval Keshtcher is a UX/UI and graphic designer specializing in early-stage startups branding and products. Yuval worked as a designer and product consultant for different types of companies and government offices. Yuval is the founder of UX Writing Hub, a one-stop shop for online UX writing resources, providing in-depth education for UX writers and product teams from all over the world. After creating the largest UX writing discussion group on Facebook, he decided to expand the services he offers and recently launched a new UX writing course. “So basically, when you are designing user experience it’s not only about how it looks but about how what is the experience for the end user. Which means your process starts with research, you speak with users, using user interviews. You define the persona, you do a competitor analysis and understand exactly what the problem that you’re trying to solve is. After doing the research you define what’s going to be the experience for your users, and you’re not doing it using graphics only. Basically, you need to plan your interface. So you start with doing a site map, and you define the task flows that users need to do. You create a hierarchy of the features that your users need to have in the interface, and when you plan it, then you work on designing the user interface. Design is about solving an existing problem, and it’s nothing about making stuff pretty. Tinder solved the problem for people who are looking for dates. Booking.com solved the problem with people that wanna book their next hotel and their next vacation. Airbnb solved the problem for people who want to rent a vacation apartment or host people. “Alright, so that’s a good question. It’s a question that’s very similar to what’s the difference between a graphic designer and the UX designer. So its all about, the process first of all. The process of the UX writer starts with understanding how to interact with users, and it’s much more about web copy and product copy and working with product designers and front end developers. This is what a UX writer does, writing copy for interfaces and products. Does it mean that UX writing copy is usually shorter? “Not necessarily, it’s not that the UX writer writes short copy and that’s about it. You can write onboarding that is going to be super long, but the fact that the onboarding process is very clear, it makes the product much more usable, and the learning curve becomes much easier for the end user. How Do You Become a UX Writer? “First of all, I would never say to anyone ‘Sign up for my course and you will know all the secret’. We have the community, have been sharing their content for free for many years already. And the course is for very specific people, that are serious enough to take this as a profession, and I said before, not everybody can get into the course. That’s why we have such a long waiting list, and only fifteen people every time that actually participating in the course. The tip that I have for people that are UX beginners, whether they are UX designers or UX writers, is to take an existing problem, take a product that you use on a daily basis. We all use digital products all the time. And see which kind of usability problem, that product has. You know when you have your favorite app and sometimes you think to yourself, ‘I would definitely do something different here’. So I would recommend for someone that wanna get into the field – start having that mindset of solving problems for end users. And at the beginning, it will be a very interesting idea to be in the shoes of that end user, and start solving problems of apps that you personally use. Why Designers Are Still Afraid of WordPress? “I think that the reason designers don’t use WordPress today is because of technical limitations. There isn’t a replacement for designer and developer working together. From experience, everything is much more flexible and you can play around with more options, than the limitations of WordPress. But, if you are a designer that’s familiar with the framework of WordPress, or with the framework of Elementor, or with the framework of any different tools that you have today, and we have many tools that’s trying to solve the problem of designing a website without code, so you would have a success. I chose to build my website in WordPress, and it has tons of benefits, and mainly because of a very accessible CMS that allows me to publish my blog posts very quickly once the website was designed. Is there an example of what UX writing is? The first part helps me understand its purpose and what it is conceptually, but a compare and contrast would be super helpful. Otherwise it’s too abstract for me to pull down and think about how to use practically.